F This Movie! : FTM 468 - PAN SHOT! FTM 468 - PAN SHOT! Patrick and JB catch up on all of the movies they've seen recently. 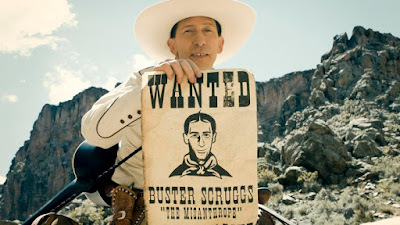 I was lucky enough to see the Ballad of Buster Scruggs on the big screen, it's glorious. See it at the cinema if you can. Hmmm, I'm going to have to check that out sometime. I've seen it as a teenager in the 90's in music class, but don't remember much. I didn't realize it was held in such high esteem. I saw the director's cut on blu ray for the first time earlier this year, it was a revelation. Got only 30 minutes into ballad of buster Scruggs before retiring last night. it felt like a lesser version of a Coen brothers production. While goofy and entertaining it just seemed to lack the je ne sais quoi of a Coen feature. Almost as if the writing and filming were punched out faster and cheaper. Like they went forward with an early draft instead a final one. I agree with JB. I think The Haunting of Hill House kind of loses steam at the end, peaking at episode 7, but it's still great and I recommend it to everyone, nonetheless. I really liked the Ballad of Buster Scruggs, but I couldn't disagree more about the last segment being the weakest. On my second viewing, with family on Thanksgiving, it was easily my favorite. It really brings the whole thing together and is both funny and poignant. My favorite Mike Flanagan movie is Ouija: Origin of Evil. It's legit a great horror film that I feel like has been completely forgotten. The Haunting of Hill House falls apart so bad at the end but it's a pretty good 10 hour family drama mixed with some horror. Haunting of Hill House is a show that really gets it. And it’s scary as hell because of the way it stays with you. It’s adult-scary. The mental illness aspect of the show broke me down at many points and flat out made cry numerous times because of different reasons. The actors are amazing, and it gave me nightmares, but at the end of the day, it was all cathartic. It’s an making piece of work. Buster Scruggs is good as a whole, the Zoe Kazaan segment is some of the finest time spent inside a classic western world since Unforgiven. What it episode 8? The big scare jump? Still in denial regarding the end of ALL THAT JAZZ! I enjoy JB podcasts the most and I think not having a specific topic other than what you've seen lately serves you well. Was it episode 8? The big scare jump from hill house? Best jump scare of the year!